Romania’s Social Democrat government made good on Sunday on a promise by the prime minister to repeal a decree decriminalizing some graft offences, as nationwide protests against high-level corruption entered a sixth day. The government also said it also agreed to declassify transcripts of debates during Thursday’s cabinet meeting at which the decree was approved. 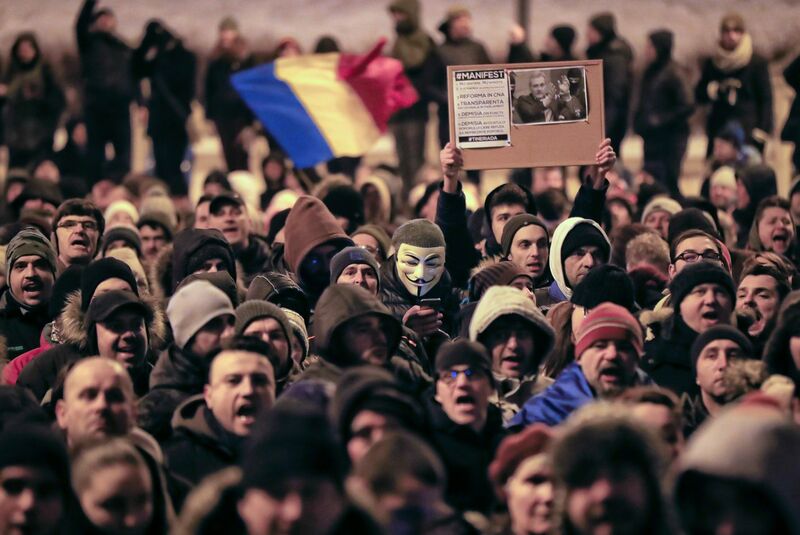 News of its approval, which would have led to dozens of politicians being shielded from prosecution for corruption, triggered the biggest public protests in Romania since 1989, when the Communist regime of Nicolae Ceausescu collapsed, reports Reuters. Prime Minister Sorin Grindeanu said on Saturday he would scrap the measure, as requested by President Klaus Iohannis, as he did not want to “divide Romania”. On Sunday, about 5,000 anti-government protesters gathered in front of government offices in Victoriei Square in central Bucharest while a separate group of about 1,000 mostly older demonstrators denounced Iohannis as a “traitor” outside the presidential palace. Social Democrat leader Liviu Dragnea, barred from political office due to a conviction for vote-rigging, denied on his Facebook page that his party had organized the anti-Iohannis protest. The decree could also have benefited Dragnea – who picked Grindeanu to lead the government in his place – by waiving abuse-of-office charge he is standing trial on. He denies wrongdoing. The government said its introduction was a bid to relive pressure on the prison system. It would have come into force at the end of next week. Seen by its critics as the biggest retreat on reforms since Romania joined the European Union in 2007, the decree would have exempted abuse-of-power offences involving sums below 200,000 lei ($48,000) from prosecution – shielding hundreds of officials from justice. Nine Western powers including Germany and the United States said they were deeply concerned the decree could undermine Romania’s partnerships in the EU and NATO.